Picture of the Week – Art in Action! I was driving home from work last Thursday when I spotted local artist Dan Nelson with his easle set up on the sidewalk at the intersection of Peace & Person Streets in downtown Raleigh. 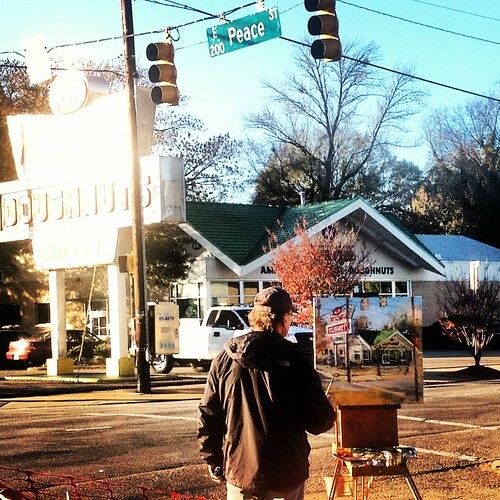 I pulled over and snapped this picture of him capturing the local Krispy Kreme shop on his canvas as the sun was setting. Dan is an incredible artist and is well known for his live art performances were he creates amazing works right in front of the audiences eyes. You can learn more about Dan’s work and find out were he will be next by following him on facebook. According to his most recent post, the painting he was creating above is now complete and on display and available for sale at PieBird.